Create your very own custom treat/gift bags and box. All you do is print, cut and create! 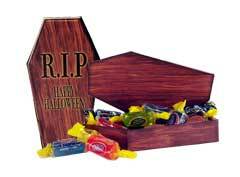 Create this killer coffin and fill with Halloween treats for your favorite goblins!! Print, cut, fold and glue to create this spooky little treat box. It makes a great party favor or gift for you most special trick or treaters! Paper Craft Coffin Free Download! The holiday season is officially here and the time for holiday gift giving and decorating has arrived, I spent this week working on some fun paper craft projects for decorating my home this holiday season. Each of these projects can be used as a decoration, gift or both! I plan to fill each come with some candies and a beaded book mark then hang them on my tree as decorations until it is time to give them away. These are really fun, easy projects. 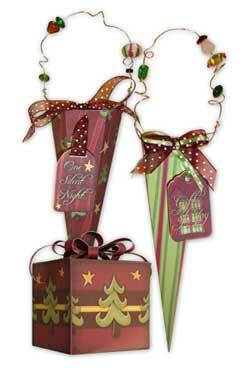 All the patterns are available for free download on our Christmas Paper Crafts page. The decorated gift box is also available for free. If you would like to purchase the rest of the paper I used for these creations click our "Gifts of Joy" Collection.